When It Gets Cold - The Muskie Fishing Heats Up! They say it's easier to catch muskie when the water (and air) temperatures drop - and it is! When you decide to go fishing in the late fall, your trip preparation takes on a whole new meaning. Because virtually no one is out on the lake, the air temp is often below freezing and the water temps are in the high 30s, making sure you can brave the elements is the first order of business. I recommend you dress like you would when you go ice fishing - so winter boots and a snowsuit that's not too bulky are your best best. Wear layers of clothing so you can peel one off if you get too warm - not usually a problem - but you never know! The other thing to remember is one of your layers should be your life jacket. Unless you have one on, a slip off the boat into the lake will not have a good outcome. The other thing is to bring extra food with you and make sure someone not with you knows where you are going fishing, when you expect to be back and will make a call on your behalf if you do not return at the planned time. Remembering these things could save your life if you break down or get lost on the lake! I also recommend you bring a waterproof tarp and a small handsaw and you pack several lighters so you can start a fire if you become stranded and to get out of any wet weather (it often snows in late fall up here). If you're going to fish for late fall muskie, you'd better dress warm. I'm wearing my life jacket under the outer layer here. Darren and I like to go to a relatively remote lake called Dryberry Lake south-east of Kenora. The road in is always an adventure - it's not maintained and you need a 4x4 to navigate the deep potholes and to get up some of the hills - especially if snow has fallen. 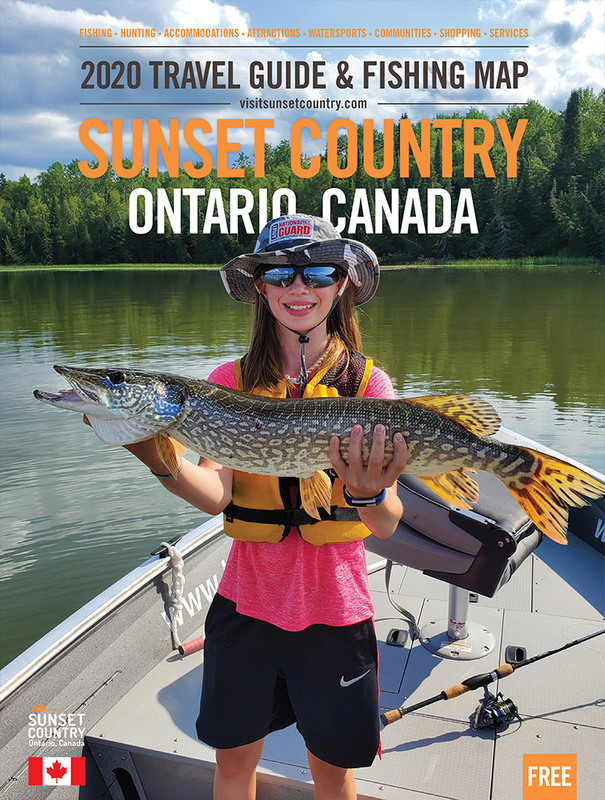 Dryberry is a Conservation Reserve and is a lake known for its world-class trout fishery in addition to harboring muskie, northern pike and a great population of big smallmouth bass! So if you decide to fish this lake, go slow when driving down the access road (located off Highway 71) or your truck won't like you very much. The boat launch itself is concrete and in good condition albeit the dock is no longer usable. The dock (now condemned) at the boat launch on Dryberry Lake. The launch is in A1 shape though! While we have had a few nice, mild days on our October trips, where we can toss bucktails or surface baits, most of the time the temperature is near or just below freezing and that feels even colder when you're in the boat and on the water. So while we have caught a few fish casting, to conserve heat and energy, we usually have the boat top up to stop the wind and the rain/snow if the weather's bad, and we usually just troll the shorelines on the lake. We seem to have the most luck along edges of flat reefs and in bays where there is a sand/rock transition. Why, well, we're not sure but as long as we catch fish, we don't really care! Late fall muskie fishing can be a combination of cold monotony while waiting for a fish to bite changing to a frantic frenzy of action if the fish turn on. Our first trip on October 21st of 2018 is a good example, we saw no fish for two hours, then caught 3 fish in a frantic 55-minute stretch, then nothing for the remaining 5 hours on the lake after that. That's kind of the way muskie fishing is. On occasion, we'll be surprised with a northern - usually a big one - hitting the baits but not always! Pike sometimes bite a muskie bait - this is a nice 35 inch northern I caught in early October when it was still relatively warm outside. I highly recommend you try catching this elusive fish in the late fall. As hard as they are to catch, when the water temps hit the thirties the muskie definitely become more aggressive in their feeding activity. But as fun as it is to catch them, just make sure you're prepared for the trip. We have several lodges that cater to late season muskie anglers and if you plan on fishing big or unfamiliar waters, then consider hiring a fishing guide - at least for the first day. If you do go on your own, remember to let someone know where you're going and what time you'll be back. If things go bad, someone will come looking for you. Other than those things, remember to use your head while out on the water and I know you'll have a wonderful time and who knows, maybe even catch a super-tanker! If after reading this blog post you want to give fall fishing a try, here are some useful resources! The shoreline takes on a different look when you fish Canada in late fall. Musky Fishing in late October!